This tactical-looking pouch can be tied easily using one knot design. If you look closely at the pouch you will notice that it is simply a Wide Solomon Bar that is lashed together on the sides. 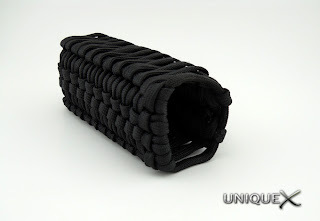 The amount of paracord you will need depends on the size of the pouch, I used four-seven feet long strands for the Wide Solomon Bar section and two-four feet long strands for the sides. You will also need a short strand to go around the top of the pouch and about two feet for the Solomon Bar on the backside to make a loop for a belt. You will notice that most instructions on tying a Wide Solomon Bar uses three strands, the two strands on either end are for the Solomon Bar section and the middle strand is the "X" strand that joins the two Solomon Bar sections. I added an extra strand to each of the Solomon Bars in order to make the finished Wide Solomon Bars wider so that the magazine will slide in and out of the pouch easier. You need to measure the full vertical length of your magazine (front-bottom-back). View the video by JD at TyingItAllTogether to show the tying technique. You will notice there is a single strand that is the core strand that both sides of the Solomon Bar are tied around, both of these strands need to be just a little longer than the length you previously measured. 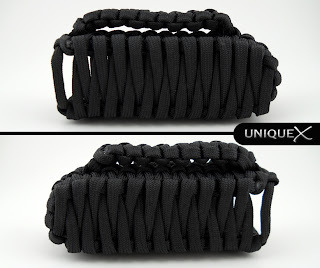 Instead of using a metal ring to lash the strands, use a length of paracord approximately one foot long. Keep tying until you've almost reached the length you need. Use the inner core strands and form a loop on the end of each strand and either sew it together, or singe it together. Continue tying the Wide Solomon Bar until you've almost covered the loops, bring the bottom end around the back forming a "U" shape and then insert the strand that you used for the metal ring into the loops that you formed. 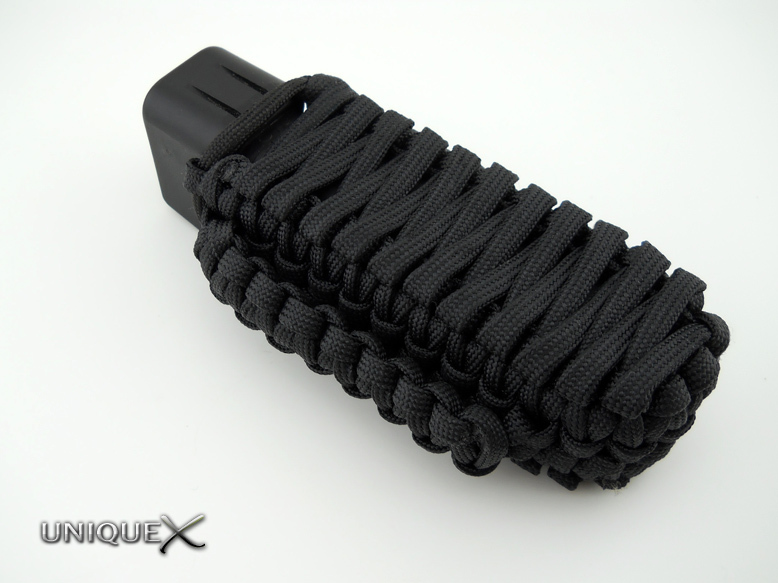 For the sides, I removed the inner strands of the paracord and made a zigzag pattern to lash the sides together. 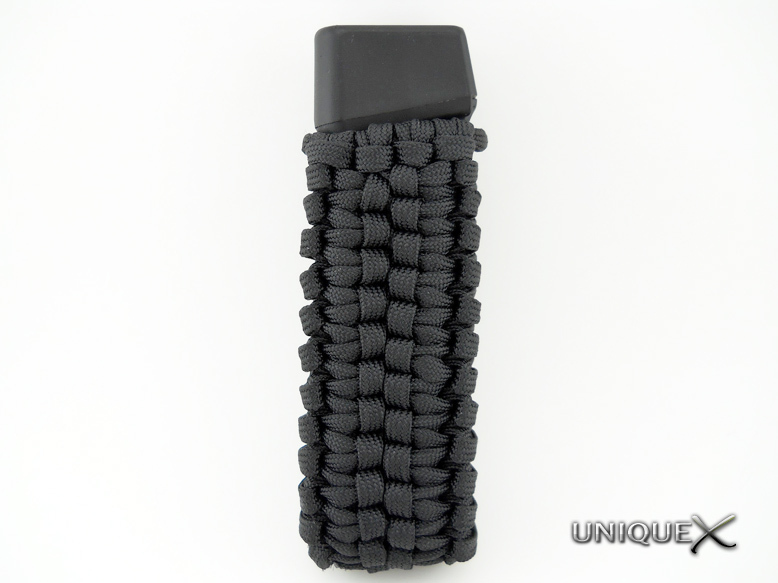 For the belt loop, I attached a short strand of paracord through a couple of loops on the backside by using a Lacing Needle. Once I had two strands attached to the pouch, I tied a Solomon Bar around the strands. That's pretty much all there is to tying this pouch, it is really easy to tie once you've figured out how to tie the Wide Solomon Bar.